Do you struggle to make one worksheet work for your whole class? Are you trying to differentiate without pulling your hair out? I have been there, and I feel for you. While I am not a worksheet kind of teacher, I do understand that they have their time and place in just about every classroom. While they are necessary, they can be difficult to reach every student with, and in the modern classroom that poses some serious issues. 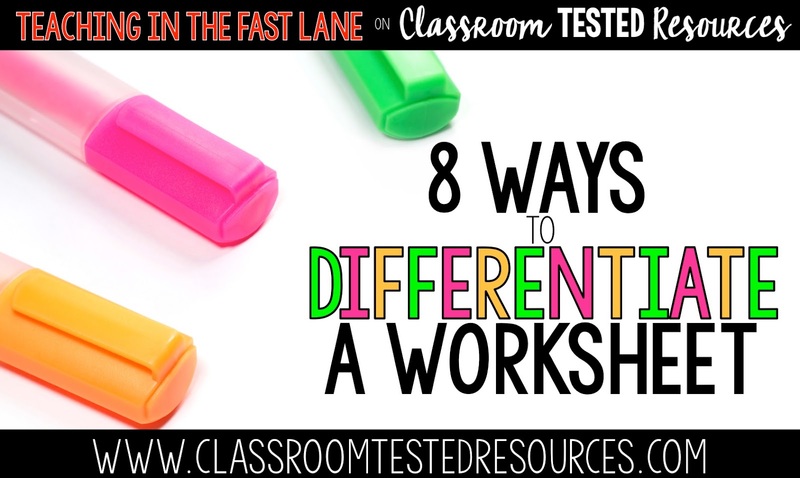 Differentiation is such a buzzword these days, as it should be with individualized learning, but it can add a lot to a teacher's workload. It doesn't have to though! Differentiation isn't always a big sweeping change in what you are doing, sometimes it is more about how you structure an assignment, than it is about the assignment itself. 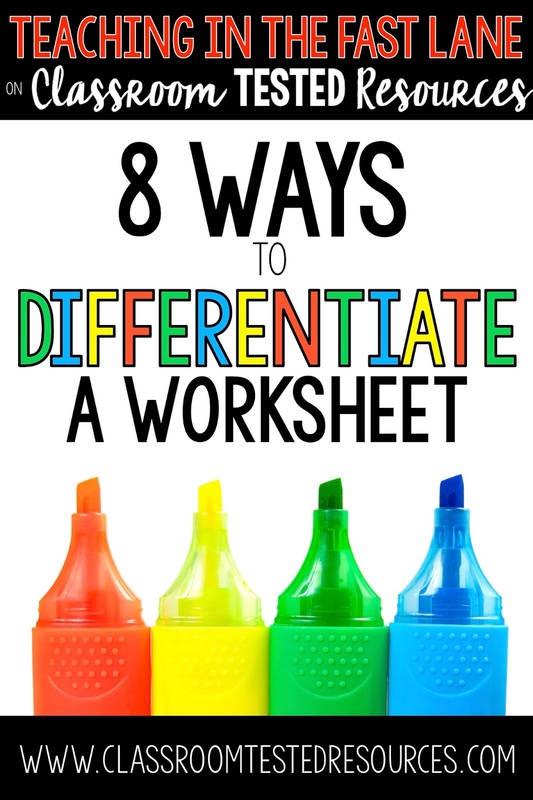 With this being said, I would like to share my 8 favorite ways to differentiate a worksheet. A highlighter is a magical little tool. It is super easy to stick one in your pocket or clip it to your lanyard so that you have it at a moment's notice to whip out and be ready to differentiate like a boss. I use a highlighter to select items for a student to complete. I use this tool when there are specific items that I need to see student's progress on. When using a highlighter it usually means that I am the one selecting which items need to be completed, and it is usually more than half of the items. Sometimes I will ask the student which item they are struggling with and work with them on that item, and then highlight items that will compliment their learning based on that item. A fringe benefit of using the highlighter is that students love the color that is added to their paper. My favorite highlighters are the Frixion erasable highlighters, because a teacher reserves the right to change her mind. Evens or Odds is a great tool for students that struggle to complete an entire worksheet, but still need practice, or students who get bogged down thinking about completing a lot of items. This differentiation strategy is as easy as it sounds, students simply complete either the even or odd numbered items. To add a little bit of fun, and instantly engage students, I will play a quick game of evens or odds with them to determine whether they will be completing the Evens or Odds items. It gets them pumped every time. This strategy, much like Evens or Odds works well when students should be completing about half of the items on a worksheet. This differentiation strategy is great for students that seem to get overwhelmed looking at an entire worksheet, so by folding the paper in half, they have less to look at and can be less intimidating. Similarly, you can continue folding the paper into fourths if a student needs to look at even less. Similarly, I have cut up worksheets into smaller pieces to give to students who need a little more to help ease their anxiety. In this case I give students one piece at a time, but often wind of giving them the whole assignment, just in pieces. This differentiation tool is amazing for students that need a little bit of control, because it offers choice. In this case I generally have a highlighter and meet with a student. I tell them what the different sections are and use my highlighter to split up the items based on standard. Then I write in highlighter how many of each item I expect them to complete. Finally, I leave the highlighter with the student to choose. It becomes their responsibility to choose items for each standard to highlight and complete. It absolutely amazes me how students exceed my expectations just about every time I use this strategy. The idea that the teacher is allowing them the choice of which problems they wish to complete is empowering, and they really take it on. This differentiation strategy is great for students that are fully capable of completing an assignment, but lack the motivation or follow through. A challenge can take on many different forms, but it is basically simple reverse psychology. It sounds a little something like, "This is a tough one, it is actually something I would ask fifth graders (if you are teaching fourth grade) to do, but I think you might be able to get through it. What do you think?" Then I ask students to tell me how many of the items they think they can complete correctly, and we essentially make a little wager. Usually it is something along the lines of if you complete ___ items correctly then you can take your shoes off for the rest of the day. This strategy works with a very specific type of student, and not every time, but it can be a life saver. I am a huge proponent of cooperative learning in every aspect, but it is a miracle worker when it comes to differentiation. It is a powerful tool for all learners, but it is especially great for our English Language Learners. My favorite cooperative learning structure for completing a worksheet is Sage-N-Scribe, because it allows students to help each other all while voicing exactly what they are doing. This strategy is amazing for all students, because voicing their thinking really makes them work on their metacognition and work on academic vocabulary. It also allows me, as the teacher, to hear how my students are doing. 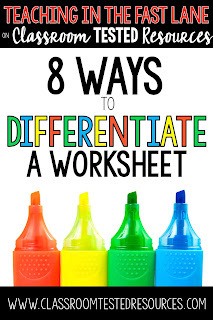 It is sometimes hard to remember that students need differentiation in both directions, so these next two strategies focus on differentiation for our faster workers, higher achievers, and creative thinkers, but are great for students of all skill levels. 1. The teacher writes an extension question on the board for students to respond to. 2. Students create their own extension question to respond to. Both of these options are powerful, but I would argue that the more creative questions and explanations come from the students. I love this strategy when we are working on mastery. While students are working, as they show mastery of a standard I given them a pen, I used purple, and they were then allowed to move around the room and offer help to other students. This tool can be really powerful in giving confidence to students and giving them control of their learning. It is also a great motivator to get students working. I purposely look for students that sometimes struggle to give the almighty purple pen to, because they are actually getting more practice while helping others. These eight strategies have worked miracles for me, and I know that they can be a great set of tools to add to your toolbox as well. What strategies have you tried? 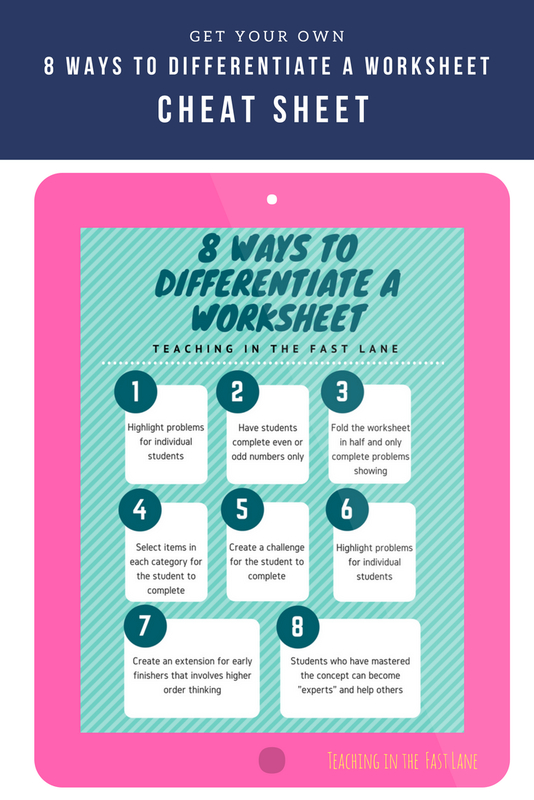 Subscribe to get the 8 Ways to Differentiate a Worksheet one-pager! Success! Now check your email to get your one-pager! Love all of these ideas! Sage-n-Scribe was completely new. I am OBSESSED with Sage-N-Scribe, because it puts students in the driver's seat and frees me up to listen to their thinking. I have had some of the absolute best conversations with students during this activity. I love this!! Do you have a copy of this that I could print out and give to teachers? Thanks!!!! Sorry to say that I don't have a handout, but would love for you to share the link! I will see if I can get something together to add to the post, and will edit this comment if I can. If you click the printer icon on the left hand side, it gives you a printer-friendly version. Great ideas!!! I will try this year!!! Thank you! Thanks for this post. I can't wait to share these ideas with my school. For my quicker scholars, they love to use my teacher's guide to check their work. They see instantly how many they missed. They love spending time looking at examples of lessons and feel so big! That's awesome Toni! I love that idea! Thanks for these! I didn't realize how many of these I have already used. It's nice to know they have names to them, too. I will be sharing this link with the newest members of my team this year. Don't you love that? I always love to get confirmation that what I know to be good in my head is very instructionally sound too! The questions on my comprehension worksheets start off easier and get more difficult through the worksheet. Question 1-4 are for my struggling students, 5-7 average student, 8-10 above grade level. I will assign "certain" groups questions. They break out later with someone from another group and go over answers and how they achieved them. This way they get the material that fits their needs but also learn from their peers. also learn from their peers.